Internationally acclaimed healer and bestselling author Dr. Zhi Gang Sha provides a simple answer to the age-old question, what is the real secret to healing? Trained as a Western medical doctor in China and a practitioner of traditional Chinese medicine in China and North America, Dr. Sha takes integrative medicine to a whole new and exciting era that goes beyond mind over matter, emphasizing soul over matter. Many people invoke the spiritual world to heal through prayer, but the results vary greatly. Dr. Sha believes the reason is that one must follow certain spiritual principles and laws to receive maximum healing benefits from the spiritual world. For example, Soul Wisdom argues that spiritual blockages occur in the heart chakra and are due to bad karma, the sum of total mistakes one has made in this and previous lifetimes. By following Dr. Sha's teachings, listeners can learn to clear up these blockages, particularly using such simple notions such as unconditional love, forgiveness, and service. As Dr. Sha puts it, 'Love melts all blockages and forgiveness brings peace.' And most importantly, listeners have the ability to heal themselves. In Soul Wisdom, Dr. Sha's talks of being a mere servant; that the teachings in his works are secret treasures handed down from his revered teacher, Master and Dr. Zhi Chen Guo. He also talks of the Soul Light Era, a major transition in the way we communicate, from speech to soul. 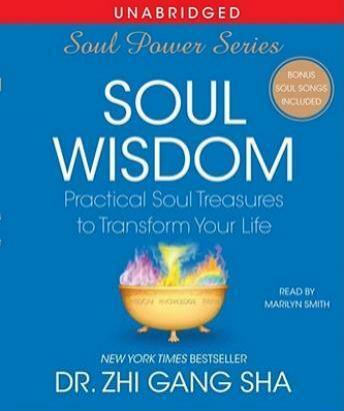 Fundamentally Dr. Sha sees Soul Wisdom as a gift from the Divine or higher power. Essentially this is the an introductory guide for all of us to learn practical techniques to help open our minds, empower, heal, and transform every aspect of our lives. It truly is Dr. Sha's hope that Soul Wisdom will begin his teachings of Soul Language, in an effort to enlighten souls and create love, peace and harmony for humanity, Mother Earth and the universe.